The prolonged bear market has taken a toll on the crypto community, but there’s more to the cryptocurrency market than just coin price and market cap. Data and insights about the industry’s performance as a whole can shed better light on the state of the cryptocurrency. CoinGecko‘s official Q3 2018 cryptocurrency report provides us with a deeper look at how the crypto market performed in Q3. Here, we take a look at some of the key data presented in the report. What Are the Highest-Performing Coins? Among the specifics covered in the report are the performances of the industry’s top 5 cryptocurrencies. 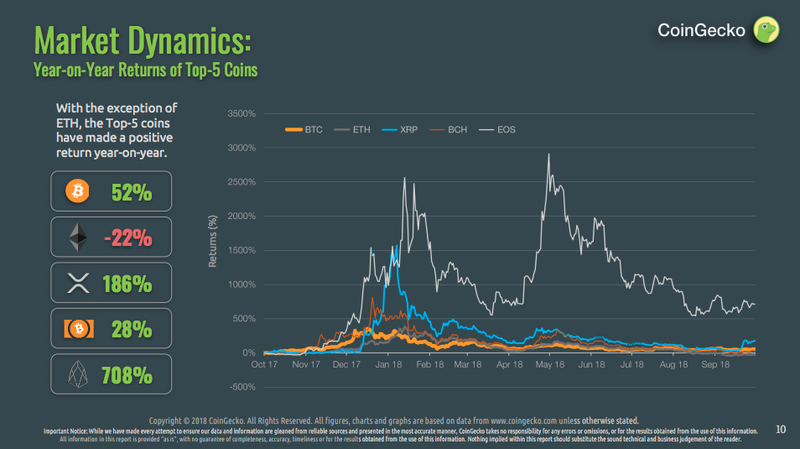 While it may seem like Q3 has been marred with low-performance results among top-of-the-line digital assets, all except for Ethereum have managed to show positive year-on-year returns. The report suggests that Ethereum has dropped by roughly 22% since the previous quarter, while others have shown significant improvements. Bitcoin, for example, is up by nearly 52%, while its newborn child, Bitcoin Cash, is up by 28%. Ripple’s XRP is up by an impressive 186%, though perhaps the biggest performer has been EOS, the 5th-largest cryptocurrency by market cap. The asset recently outdid Litecoin to overtake the #5 spot and has grown by approximately 708%. This news differs heavily from data gathered during Q1, which was still surfing the wave of the ongoing crypto hype witnessed in November and December 2017. That time around, the biggest performer was Ripple, whose growth of 2,156% makes its present 186% figure look like small beans. The 3rd-largest cryptocurrency burst onto the scene and was stretching into $1, $2, and $3 territory before ultimately falling short a month later when cryptocurrency prices crashed. The 2nd-biggest performer was Litecoin, which exploded by roughly 1,571% from the final quarter of 2017. Then came Ethereum, with a growth figure of about 684%, followed by Bitcoin at 536%. The low performer at that time was Bitcoin Cash, which ultimately fell about 9% from Q4 2017 to Q1 2018. According to the latest report, Q3 was marred by news that many digital currency exchanges have adopted a new strategy called “trans-fee mining,” which seeks to boost exchange trading volume. Trans-fee mining occurs when new exchange-based tokens are created through rebating exchange transaction fees, and then extracted through a traditional mining process similar with what one sees in with Bitcoin. Newly-launched exchange Fcoin is the “culprit” behind trans-fee mining’s popularity. It was the first company to implement the controversial strategy, while other exchanges, such as Bitforex, OKEx, ZB, and Conbene later followed suit. Trans-fee mining boosts exchange trading volumes, and thus the report shows that trading has increased tenfold from one quarter to the next despite ongoing bearish sentiment. However, many critics note that the results garnered through trans-fee mining are only temporary. Initially, exchanges witness excitement following the system’s implementation, though most are unable to retain their popularity and high trading volumes once the hype dies down. One of the big highlights of the Q3 report is that new digital exchanges are popping up left and right. In total, about 65 new digital exchanges have appeared in Q3 – a slight increase over the 63 exchanges seen in Q2. The Q1 report shows similar data, but for initial coin offerings (ICOs) rather than exchanges. 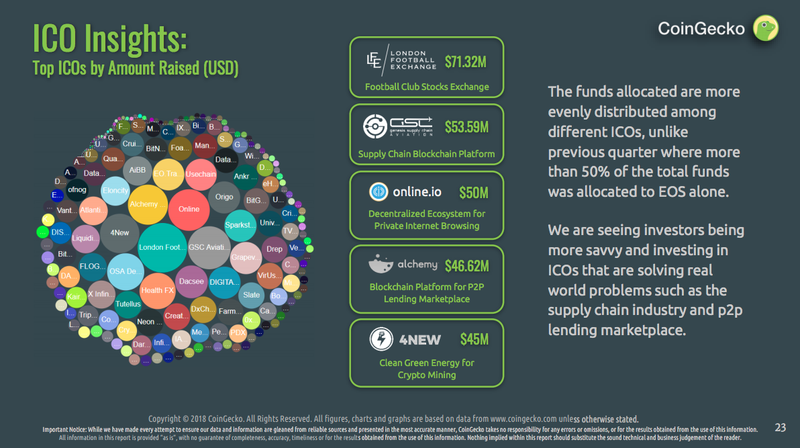 In Q1 2018, CoinGecko specifies that approximately 248 different ICOs managed to raise a whopping $3.7 billion in just a short period. In addition, the industry was being marked by ICOs designed to raise money for platform blockchains such as Ethereum, EOS, and NEO, while many others were seeking to strike the financial industry. Have ICOs Lost Their Touch? Q3 experienced a downturn in the number of valid ICOs. In total, only about 388 ICOs were launched in Q3 – a 36% decline from the 606 ICOs launched in Q2. Furthermore, roughly 55% fewer funds were raised in Q3 than they were in Q2, with the top-funded ICO garnering just over $70 million. Over the past year, it is estimated that many investors have lost funds to fraudulent ICOs. In fact, one source suggests that over half a billion dollars have been stolen by companies and startup ventures launching ICOs under the pretense that they are seeking to raise capital to fund their operations. Instead, they wind up just taking the money and disappearing. These latest figures suggest that investors and traders are becoming smarter regarding which projects are real and which are phony. 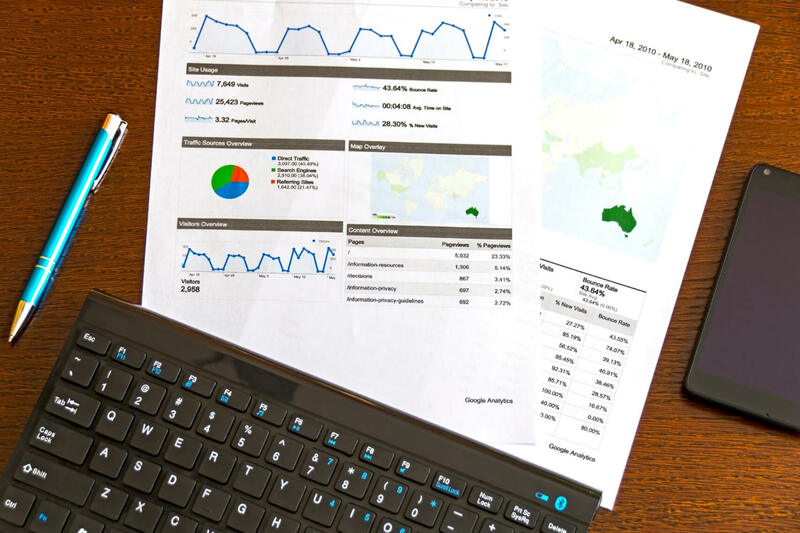 Like its previous reports, CoinGecko’s Q3 report also includes information on relevant world happenings surrounding the cryptocurrency arena, as well as deeper insights in the market and ICOs. In this edition, they’ve also included special sections exploring masternodes and non-fungible tokens. To download the full Q3 report from CoinGecko, click here. You can also see our coverage of their Q1 2018 and Q2 2018 reports.